I want to know if I can host storyline quizzes and how? Also, if I can test a quiz and see how the report and the result will be. Moreover, can i share the course so that no registration from users to do the quiz (anyone can do it and i want the result after). Training-Online.eu LMS supports also Articulate Storyline SCORM1.2 packages, you may upload them to the system and create the SCORM lesson. The reporting is done to the detail question level if you set in the SCORM package. Please see our support forum articles, hope they explain you questions. 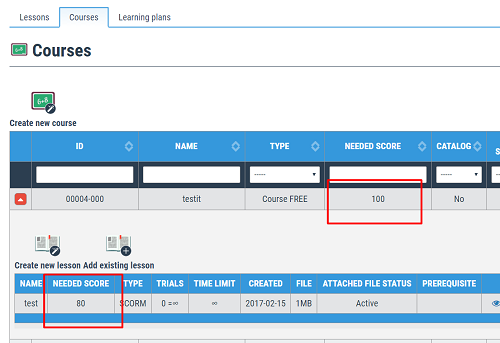 To your question regarding SCORM offline study, if I understood well, that's something outside the LMS and our LMS functionality allows to track only scorm lessons that are within the LMS. On the other hand, Training-Online.eu allows to have FREE Course, including the SCORM lesson, so you don't need to worry about some related costs. Edited 1 time(s). Last edit at 02/15/2017 07:08PM by admin_admin. Regarding the reports for the quiz, I set the tracking to result slide in the SCORM package, but when the user did the quiz, I didn't see the result in the Reports field on my admin page. (and the progress is 0% for that user). Anyone can do the quiz I mean that I want to put it on my website for example so that users can enter and do it. (not offline, sharing the quiz). You are in Reporting module / Course view tab and see 0%. That's correct behavior, given by the fact, that you define the completion score for the course and also the completion score for the lesson. In your case, there is the Course completion set to 100% and contains 1 lesson where is the completion score set to 80%. Means you have to complete the lesson to see the progress on the course level. If you go to the Reporting module / Detailed view tab, you may see the is lesson completion score at 29%. You may also see the individual question answers. To handle some advanced statistics, MS excel would be the best tool, as you will handle quite large amount of data. Edited 2 time(s). Last edit at 02/15/2017 07:49PM by admin_admin.